Over the past decade, biomedical scientists and engineers have increasingly abandoned conventional cell culture methods, which often confine cells to a monolayer at the bottom of a dish or plate, in favor of novel 3D techniques. A number of presentations at the “3D Cell Culture” conference, held in Zurich earlier this year, and sponsored by the DECHEMA Society for Chemical Engineering, revealed the current state of the art—and what is on the horizon. “By introducing more organotypic, more physiologic model systems, scientists will gain higher-quality data assessment and better ‘de-risking’ of their compounds in an in vitro situation before they start with expensive preclinical and clinical trials,” explained Jens Kelm, Ph.D., cofounder of InSphero. The first model system developed by InSphero is that of spherical tumor microtissues, which are thought to behave similarly to tumors. These spheroid microtissues self-assemble from cells in hanging drops, even in the absence of scaffolds. Dr. Kelm noted that hanging-drop technology is not itself new; however, advances in automation and equipment now allow formation of microtissues in 96-well plates, where they may easily be assayed for properties such as sensitivity to drugs. Having demonstrated that tumor microtissues can be created and assayed in high-throughput fashion, Dr. Kelm’s team is now working toward additional scaffold-free models for the four main organs of toxicology research: brain, heart, kidney, and liver. In each case, models will be considered valid if they can perform tissue-specific functions. For tumors, these functions include expression of cell-surface receptors and formation of extracellular matrix (ECM), said Dr. Kelm. Stefan Przyborski, Ph.D., CSO of Reinnervate, addressed the topic of scaffolds for 3D cultures. His research, like that of Dr. Kelm, grew out of concerns that cells grown as a monolayer did not behave like cells in vivo. Not only do these cells become unnaturally elongated and flattened, they are under stress and have limited potential for cell-cell interactions. Reinnervate aims to facilitate growth of cultures in 3D with a scaffolding material that it calls alvetex®. Alvetex is made from polystyrene, as is 2D cell culture plasticware, but comes as a highly porous 200-micron-thick membrane into which cells can grow and maintain their natural 3D structure. “Alvetex polystyrene scaffold simply provides cells with a support structure that allows them to move inside and to continue to grow, while not allowing them to flatten out, as would happen in a traditional 2D culture setting,” according to Dr. Przyborski. Because of the thinness and porosity of scaffolds such as alvetex, cells inside the scaffold may exchange nutrients and waste products with the growth media via passive diffusion. 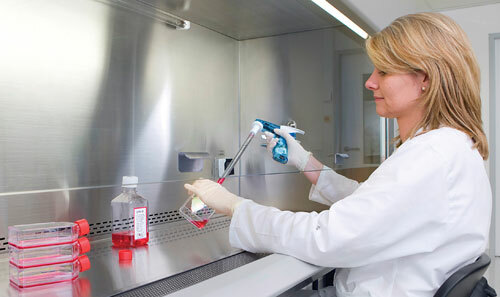 Media is typically replaced by routine manual pipetting, though a new collaboration between Reinnervate and Tecan will work toward automation of this process. The best placement of a scaffold within the wells of a plate depends on the downstream assays that are planned. Dr. Weiser reported on a 3D liver model based on RegeneMed technology, in which nonparenchymal cells (Kupffer cells, endothelial cells, stellate cells, and bile duct epithelial cells) are grown on a nylon scaffold, followed by addition of hepatocytes. Roche’s preliminary data suggests that the nonparenchymal cells are needed for in vitro reproduction of in vivo responses to model compounds. 3D co-cultures may thus enable studies of the mechanisms underlying these responses. Approximating in vivo physiology is not only a matter of allowing cells to grow and develop in three dimensions; it also requires cell lines that reliably act like differentiated tissues. Creation and testing of improved cell lines were addressed by Christophe Lipps, a Ph.D. student at the Helmholtz Centre for Infection Research (HZI), and Joris Braspenning, Ph.D., a managing director of Medicyte. Tobias May, Ph.D., speaking for the HZI spinoff company InSCREENeX, summarized the limitations of established cell-culture models. Primary cells taken directly from humans or animals exhibit realistic physiology but don’t proliferate well in culture, whereas immortal cell lines do proliferate well but don’t really reflect what goes on in vivo. “We wanted to combine the advantages of both systems,” said Dr. May. So the group surveyed the literature, compiled a list of 33 genes known to be involved in proliferation, put these genes into a library, transduced the genes into primary cells, and let the best cells emerge via natural selection. 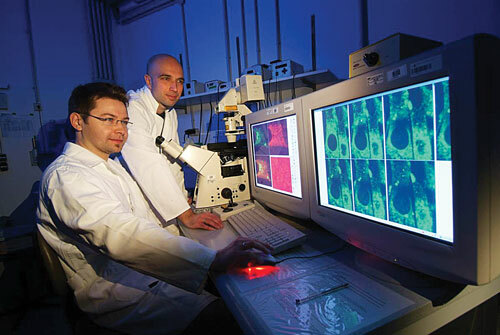 Medicyte reports that its upcyte cells can be grown in conventional 2D monolayer cultures before use in 3D scaffolds. In the next steps of this work, HZI and InSCREENeX will increase the number of available cell lines to cover various species (mice, rats, pigs, cows, humans) and cell types (endothelial cells, fibroblasts, lung epithelial cells, hepatocytes, chondrocytes). A similar approach has been taken by Medicyte, which tranduces proliferation-stimulating genes into primary human hepatocytes to create longer-living cells dubbed upcyte® hepatocytes. These cells are then grown in 3D cultures by seeding them onto alvetex scaffolds. Recent work has focused on the 3D cultures’ drug-metabolizing activity and application to cytotoxicity and drug interaction assays. Compared to 2D monolayer cultures, the 3D cultures seem to demonstrate enhanced CYP1A2, CYP2B6, and CYP3A4 enzyme activities, both at baseline levels and when induced by drugs such as omeprazole, phenobarbitone, and rifampin, respectively. Nicola Hewitt, Ph.D., a scientific consultant at Medicyte, is enthusiastic about the new opportunities made possible by 3D hepatocyte cultures. InSCREENeX establishes cell systems combining the physiological relevance of primary cells with the convenience of cell lines. As 3D cell cultures become more commonplace, there will be a corresponding need to verify the performance of assays originally developed for 2D cultures, said Terry Riss, Ph.D., a senior product specialist at Promega, who spoke at the Institute for Scientific Communications’ recent “Early Toxicity Screening” conference. There are several reasons why an assay protocol might need tweaking when applied to 3D cultures. One is the fact that cells in the middle of large 3D structures may not be disrupted as easily as cells in 2D monolayers. To ensure complete disruption of all cells, researchers may need to use “higher concentrations or different types of detergents—as long as they are compatible with the assay chemistry,” noted Dr. Riss. Physical disruption by pipetting is another option, he said. Promega offers numerous commercial kits for detecting early biochemical markers of various mechanisms of cytotoxicity. Many of the kits detect activation of pathways that respond to specific stresses such as DNA damage, heat shock, hypoxia, oxidative stress, and so forth. Promega is currently checking these kits to verify their utility with 3D culture samples. In cases where it is hard to lyse the cells, Promega is developing new assays for specific use with 3D cultures, said Dr. Riss. He hopes to validate many of these assays with 3D model systems within the next year.